At this crossing point the Icknield Way and the Ridgeway cross the River Thames. 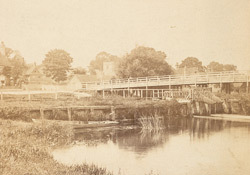 "A wooden bridge unites Streatley with the village of Goring, on the Oxfordshire bank. Goring Church has a fine old Norman tower, with the peculiarity of a smaller annexed round tower, containing the winding stair for ascent. The village was formerly famous for a medicinal spring, which was long considered to be of sovereign efficacy in the cure of cutaneous complaints. Its virtues were celebrated by Dr. Plot, in the time of Charles II., but it continued to be esteemed in 1722, for its then owner, Mr. Lybbe (an ancestor of the present Mr. Lybbe Powys, of Hardwick), published advertisements to notify that inasmuch as other water had been deceitfully sold for that of Goring Spring, all genuine bottles should henceforth bear his arms. Whether the water possessed any real efficacy has never, so far as we are aware, been tested. Its repute has long been forgotten."